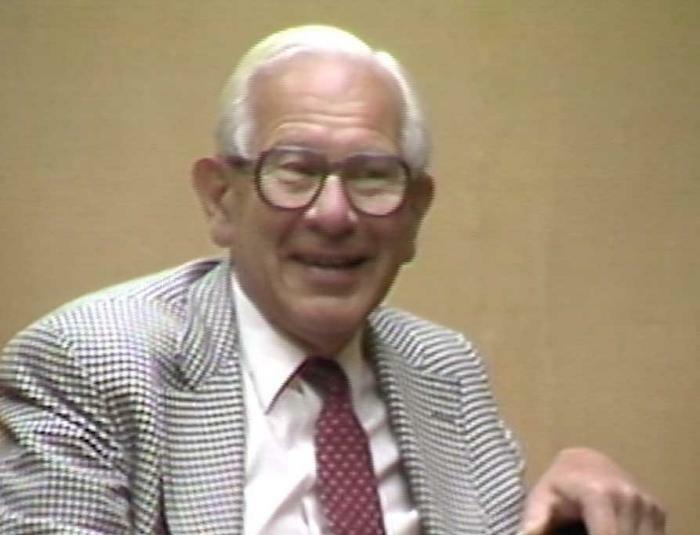 Still image from Paul H. Holocaust testimony, July 3, 1985. SynopsisPaul H. was born in Warsaw, Poland on December 14, 1911. He explains that his memories of World War I are vague due to his young age. He describes the Jewish community and his early education. He discusses his father’s death in 1929. He describes going to Cambridge University in 1930 where his brother was already studying. He describes his involvement in the Zionist movement and visiting Palestine in 1932 with his brother. They returned and restarted their father’s lumber business. He describes his marriage. He discusses how he and his brother had residency permits and visas live in England and travel around Europe. Paul recalls the German invasion of Poland and fleeing Warsaw with his wife towards Lublin. He recalls receiving assistance from a Polish officer on his journey to Hungary. He describes staying in Budapest and difficulty obtaining or renewing various visas. He recalls visiting his mother, who was living in Paris, on his way back to London. He describes emigration to Canada in 1940. He recalls corresponding with his wife’s family in Warsaw through the Red Cross during this time. He describes experiencing antisemitism in Canada and the Jewish population in Quebec and Vancouver.